I was blue this morning so I thought I’d go paint something. Sometimes you can paint out your feelings and it helps. The first two paintings I tried were not what I had in mind. Fortunately, this painting seemed to do the trick for me today. Hope you enjoy it. This painting is available on ebay, bidding begins at 99¢. This entry was posted in A pastel a day, painting a day, Pastels, seascape and tagged clouds, daily painter, dune grass, dunes, Lake Michigan, painting a day, pastel, pastel painting, seascape, snow on February 3, 2018 by Marie Marfia. I was feeling sorry for myself this afternoon. I think it’s the weather. I’m starting to get tired of the cold and the snow isn’t looking so beautiful anymore. But then the sun came out and I thought, “I bet the dunes out at the state park are lit up right now,” so I jumped in my car and raced out there. It was bone chilling cold but the sun was hitting the grass and the water and lighting up the clouds. Just flat out gorgeous and it cheered me up just to be out there taking pictures. I love living here. This entry was posted in A pastel a day, painting a day, Pastels, seascape and tagged daily painter, dune grass, dunes, painting a day, pastel, pastel a day, seascape, snow on February 2, 2018 by Marie Marfia. 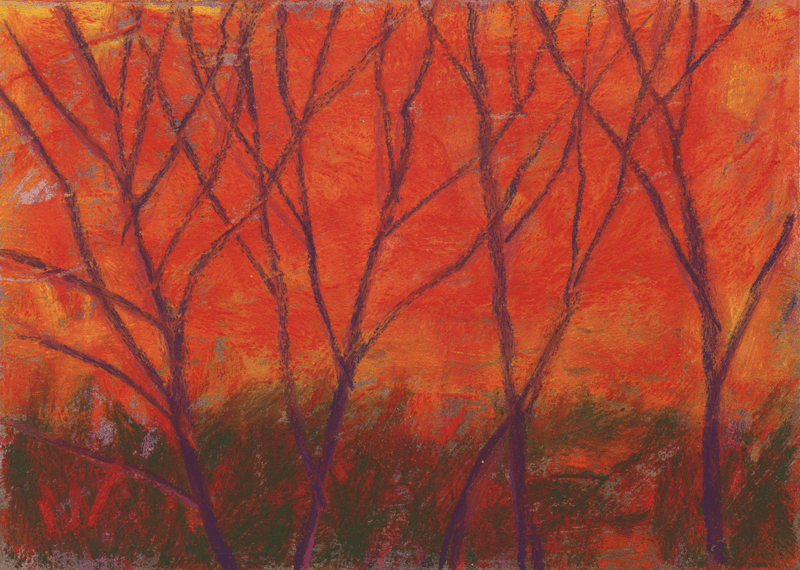 Patch of Grass, 9×6″ pastel on sanded paper. ©2018 Marie Marfia. This entry was posted in painting a day, Pastels, seascape and tagged beach, big lake, daily painter, dune, dune grass, Lake Michigan, painting, painting a day, pastel, seascape on January 31, 2018 by Marie Marfia. I stepped outside this morning, letting the dogs out to pee, and when I turned around, this happened. The sky was on fire and it held me spell bound as I walked down the dirt road opposite our house. The dogs didn’t seem to notice anything out of the ordinary, but to them, every day is the best day. It’s just humans who make a fuss about sunrises and sunsets. I brushed out my first attempt at this and started over, trying to paint how I felt instead of what I thought I saw. They’re two different things, you know. 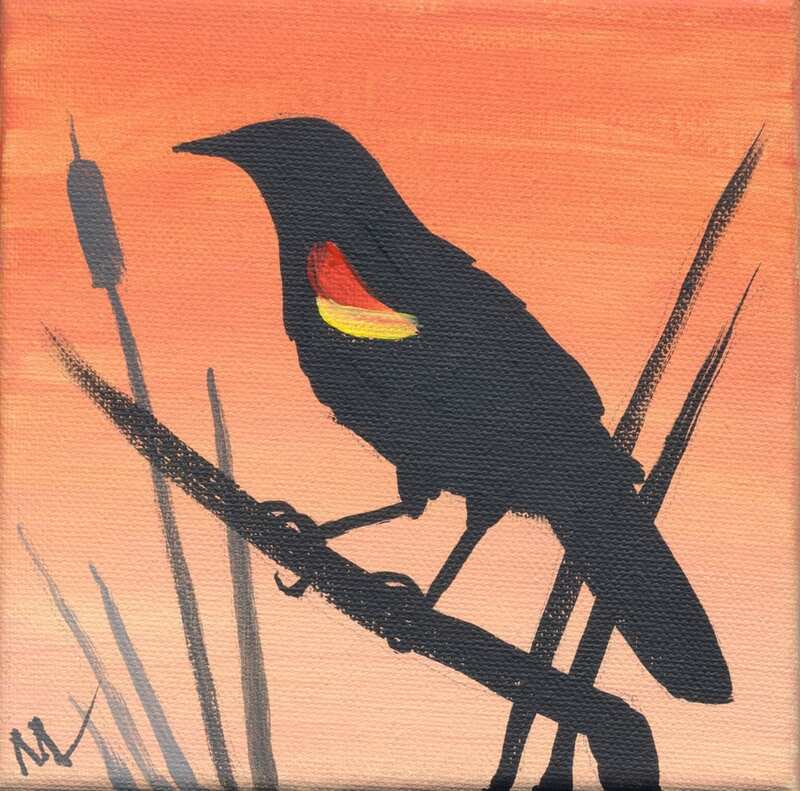 This entry was posted in A pastel a day, painting a day, Pastels, Woods scape and tagged a pastel a day, orange, painting, painting a day, pastel, red, sunrise, trees on April 5, 2017 by Marie Marfia.